For the most part, spiders get a bad rap. By and large, they are harmless, and they prefer to be left alone. They are also inadvertently helpful, considering that they like eating other insects that can be seriously annoying pests. Here in South Carolina, there are two species of spider that are bad news. 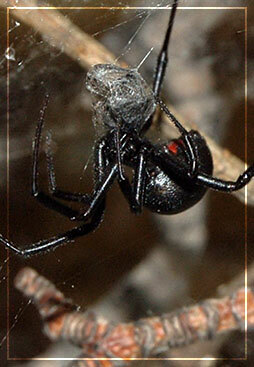 According to National Geographic, the Black Widow is the most venomous spider you’ll find in North America. So much so that their venom is actually 15 times more powerful than the venom of a rattlesnake. Luckily, they only bite when they have been bothered. The Brown Recluse is usually about the size of a quarter, and they are nicknamed violin spiders due to distinctive markings on their backs. About 10 percent of their bites are serious, and they can cause seizures, fevers, chills, and other symptoms. Should you be afraid of the Brown Recluse and the Black Widow? No, they just have a reputation that’s gotten a little overblown. Instead of overreacting, the smart move is to contact the professionals at Patriot Pest Management. As part of our spider treatment, we sweep all the webs down around the exterior of your home, in the garage and at the window frames. We treat the exterior heavily, and all the window and door frames to eliminate access inside your home. To schedule an appointment, contact us online or by phone today.